For the island in Kiribati (Southern Line Islands), see Caroline Island. Map of the Federated States of Micronesia. Palau is to the west of the map. The Caroline Islands (or the Carolines) are a widely scattered archipelago of tiny islands in the western Pacific Ocean, to the north of New Guinea. Politically they are divided between the Federated States of Micronesia in the eastern part of the group, and Palau at the extreme western end. Historically, this area was also called Nuevas Filipinas or New Philippines as they were part of the Spanish East Indies and governed from Manila in the Philippines. The Carolines span a distance of approximately 3540 kilometers (2200 miles), from Tobi, Palau at the westernmost point to Kosrae at the easternmost. The group consists of about 500 small coral islands, east of the Philippines, in the Pacific Ocean; the distance from Manila to Yap, one of the larger islands of the group, is 1,200 miles (1,900 km). Most of the islands comprise low, flat coral atolls, but some rise high above sea level. 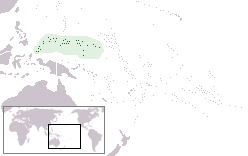 The native inhabitants speak a variety of Micronesian languages including Pohnpeian, Chuukese, Carolinian, and Kosraean, as well as the Western Malayo-Polynesian languages Palauan and Chamorro, and the unclassified language Yapese (possibly one of the Admiralty Islands languages). Other significant populations include Filipinos and Japanese. The natives live mainly on horticulture and fishing, also supplementing their diet with many different varieties of bananas and taro, either of the "swamp" or "purple" varieties. On some islands housing continues to be built with local materials including coconut thatch. The language spoken in commerce is English, but there are several indigenous languages. They traditionally believe in a Supreme Being (Yalafar) and in a bad spirit (Can), yet they have hardly any religious rites. Due to extensive missionary work, Christianity is the primary religion practiced in this region of Micronesia. Micronesian Navigator Mau Piailug was from the Carolinian island of Satawal. He learned the traditional navigation techniques of the Weriyeng school. These techniques had been preserved while similar techniques had been forgotten elsewhere partly due to the remoteness of the Carolinian Islands. In the 1970s Mau shared his knowledge with the Polynesian Voyaging Society which led to a revival of traditional Polynesian navigation and a new anthropological understanding of the history of Polynesian and Micronesian peoples. In 1985 a study was made on the origin of the sidereal compass used in the Caroline Islands. Different islands and island groups in the Carolines passed down unique and variant oral legends recounting the origins and early histories of their peoples. On Pohnpei, for example, pre-colonial history is divided into three eras: Mwehin Kawa or Mwehin Aramas (Period of Building, or Period of Peopling, before c. 1100); Mwehin Sau Deleur (Period of the Lord of Deleur, c. 1100 to c. 1628);[note 1] and Mwehin Nahnmwarki (Period of the Nahnmwarki, c. 1628 to c. 1885). 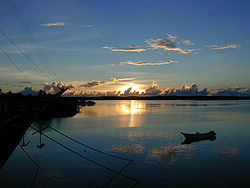 Pohnpeian legend recounts that the Saudeleur rulers, the first to bring government to Pohnpei, were of foreign origin. The Saudeleur centralized form of absolute rule is characterized in Pohnpeian legend as becoming increasingly oppressive over several generations. Arbitrary and onerous demands, as well as a reputation for offending Pohnpeian deities, sowed resentment among Pohnpeians. The Saudeleur Dynasty ended with the invasion of Isokelekel, another semi-mythical foreigner, who replaced the Saudeleur rule with the more decentralized nahnmwarki system in existence today. In mid-1525 a storm carried the Portuguese navigators Diogo da Rocha and Gomes de Sequeira eastward from the Moluccas (via Celebes); they reached several islands of the Carolines and stayed there until January 20, 1526. The Spanish explorers Toribio Alonso de Salazar and Diego de Saavedra arrived on August 22, 1526, sighting the Island of San Bartolomé or Taongui. On 1 January 1528 the discoverer Álvaro de Saavedra took possession of the Ulithi Islands on behalf of the King of Spain. Spanish explorers visited the archipelago in 1542 (Matelotes Islands), 1543, and 1545. In 1565 Miguel Lopez de Legazpi, the first Governor-General of the Philippines (in office 1565–1572), passed through. The islands, known to contemporary Spaniards as Islas de las Hermanas, Hombres Pintados and Los Jardines, dropped out of European consciousness until 1686, when Francisco de Lezcano came to Yap and called the islands Las Carolinas, in honor of King Carlos II of Spain (reigned 1665–1700). The name was extended to include the Palau Islands and the archipelagos which were named the Gilbert Islands and the Marshall Islands by British explorers who visited them a century later, between 1788 and 1799. The colonization of the Caroline Islands had, as in most of the Spanish colonies, a marked religious character. A royal decree of October 19, 1707 granted authorization for the sending of missionaries in several expeditions to the islands. One such expedition (1731) was made by Father Juan Antonio Cantova, who was killed. As a result, Spain ceased relations with the Caroline Islands until 1787. Relations resumed later, but with a distinctly commercial character. In 1852 the Spanish colonel Coello suggested to the Spanish government that the effective occupation of the Caroline Islands provided trade advantages between the Philippines and Australia, New Guinea and the Americas, but Spain ignored his suggestions until 1885. In that year, the Spanish representative Butron and the kings of Koror and Artingal signed an act which recognized the sovereignty of the king of Spain on the Carolines. Having secured the territory, Spain attempted to establish custom duties in the region in 1875, but Germany and the United Kingdom protested because Spain's previous abandonment of the islands had allowed the arrival of German and British missions there. A conflict arose, leading to the submission of these facts for arbitration by Pope Leo XIII, who recognized Spanish rights on the islands west of the 164th meridian east; he assigned to Germany the Marshall Islands and the right to maintain a naval station in one of the Caroline Islands, a right that Germany never exercised. After the Spanish–American War of 1898, Spain sold the Carolines and the Northern Marianas to Germany in the German–Spanish Treaty (1899) for 25 million pesetas or 17 million goldmark (nearly 1,000,000 pounds sterling), while reserving to itself the right to establish a coal mine in the area. Germany governed the archipelago as the Karolinen, administratively associated with German New Guinea. The islands were a popular resort for whaling ships in the 19th century. The first such vessel known to have visited was the London whaler Britannia which called at Ngatik in December 1793. Such vessels from Britain, the United States, Australia and elsewhere came for water, wood and food and, sometimes, for men willing to serve as crewmen on such vessels. These ships stimulated commerce and were significant vectors for change both good and ill. The islands most commonly visited were Kosrae, Mokil, Ngatik, Pingelap and Pohnpei. Japan invaded and occupied the islands in 1914, during World War I. This occupation was carried out by two naval squadrons: the Western Carolines under the squadron commanded by Rear Admiral Matsumura Tatsuo (1868–1932), and the Eastern Carolines under Vice-Admiral Yamaya Tanin (1866–1940). In 1920, after the conclusion of World War I, Japan received a League of Nations mandate over the Caroline and Marshall Islands. During World War II, Japan had a large base set up at Truk Lagoon which was used for expansion into the southeastern Pacific. In the latter years of the war, during the Japanese withdrawal to the Japanese home islands, the Allies effectively neutralized Truk in Operation Hailstone. After the war, the islands (together with the Marshall Islands) became trust territories of the United States, with the Federated States of Micronesia gaining independence in 1986, followed by Palau in 1994. Two Jesuits, Juan Antonio Cantova (also known as John Anthony Cantova) and Victor Walter, attempted missionary work there in 1731; the former was soon murdered and the latter obliged to flee. Two other Jesuits were killed later. In 1767 the Jesuits were suppressed in the Spanish dominions, and during the next 120 years there has been no trace of a missionary. The controversy between Germany and Spain concerning the possession of the Carolines having been settled by Pope Leo XIII in favour of Spain, the king directed Spanish Capuchins to the islands, 15 March 1886, and the Propaganda Fide officially established that mission, 15 May 1886, dividing it into two sections, named West and East Carolines respectively. Until then the islands had belonged ecclesiastically to the Vicariate Apostolic of Micronesia. The Spanish Capuchins had a catechism and prayer book printed in the Ponape dialect, and Father Anthony of Valentia wrote a small grammar and dictionary of the Yap dialect in 1890. When the Spanish Fathers had laid the foundations of the mission, these islands passed by purchase into the hands of Germany in 1899. Spain had contributed more than $5000 a year towards the mission; Germany granted no support. Spain had compelled the aborigines to send their children to school; Germany gave full liberty in this regard, and the people consequently began to neglect school as well as church. The mission thereby suffered greatly, and the Propaganda Fide finally deemed it advisable to replace the Spanish Capuchins with others of German nationality (7 November 1904) and to erect one Apostolic prefecture instead of the two separate missions (18 December 1905). The Very Reverend Father Venantius of Prechtal, Germany was appointed first prefect Apostolic. In 1906 twelve fathers and twelve brothers were working in thirteen stations, and several Sisters of St. Francis left Luxembourg to take charge of the ten schools, in which were 262 children. Ninety adult converts were the "harvest" of that year, and the Catholic population is given as 1900 among 11,600 unconverted natives and a few Protestants. The United States Government sent, 1 July 1905, a Jesuit from the Manila Observatory to erect a meteorological station on the island of Yap, of which station the Capuchin Father Callistus was appointed director. The origin of the East-Asiatic typhoons had been traced to these regions, and twice a day observations are made, and notice is frequently given to Manila by cable. 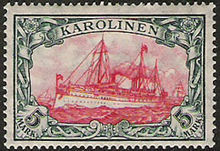 During the period of German control, Germany issued postage stamps for the islands. ^ Rosser, William Henry (1870). North Pacific pilot: The seaman's guide to the islands of the North Pacific, with an appendix on the winds, weather, currents, &c., of the North and South Pacific. J. Imray. pp. 183–184. Retrieved 28 March 2011. ^ "Distance from Tobi Island to Kosrae". Google. ^ Flood, Bo; Strong, Beret E.; Flood, William (2002). Micronesian Legends. Bess Press. pp. 145–7, 160. ISBN 1-57306-129-8. Retrieved 2012-01-01. ^ a b Hanlon, David L (1988). Upon a Stone Altar: A History of the Island of Pohnpei to 1890. Pacific Islands Monograph. 5. University of Hawaii Press. pp. 13–25. ISBN 0-8248-1124-0. Retrieved 2012-01-01. ^ Cordy, Ross H (1993). The Lelu Stone Ruins (Kosrae, Micronesia): 1978-81 Historical and Archaeological Research. Asian and Pacific Archaeology. Social Science Research Institute, University of Hawaii at Manoa. pp. 14, 254, 258. ISBN 0-8248-1134-8. Retrieved 2011-12-31. ^ Morgan, William N (1988). Prehistoric Architecture in Micronesia. University of Texas Press. pp. 60, 63, 76, 85. ISBN 0-292-76506-1. Retrieved 2011-12-31. ^ a b Panholzer, Tom; Rufino, Mauricio (2003). Place Names of Pohnpei Island: Including And (Ant) and Pakin Atolls. Bess Press. pp. xiii, xii, 101. ISBN 1-57306-166-2. Retrieved 2011-12-31. ^ Micronesica. University of Guam. 1990. pp. 92, 203, 277. Retrieved 2011-12-31. ^ Ballinger, Bill Sanborn (1978). Lost City of Stone: The Story of Nan Madol, the "Atlantis" of the Pacific. Simon and Schuster. pp. 45–8. ISBN 0-671-24030-7. Retrieved 2011-12-31. ^ Riesenberg, Saul H (1968). The Native Polity of Ponape. Contributions to Anthropology. 10. Smithsonian Institution Press. pp. 38, 51. Retrieved 2012-01-01. ^ Petersen, Glenn (1990). "Lost in the Weeds: Theme and Variation in Pohnpei Political Mythology" (PDF). Occasional Papers. Center for Pacific Islands Studies, School of Hawaiian, Asian & Pacific Studies, University of Hawaiʻi at Mānoa. 35: ch. 5. "Isokelekel", pp. 34 et seq. Retrieved 2011-12-31. ^ Galvano, Antonio (1563). The Discoveries of the World from Their First Original Unto the Year of Our Lord 1555 (2004 ed.). Kessinger Publishing, issued by the Hakluyt Society. p. 168. ISBN 0-7661-9022-6. ^ José Saínz Ramírez: Colonial empires. Nacional, 1942, Madrid.